Valentine’s Day is just around the corner! Valentine’s Day is so much more than a couple’s holiday; it’s also a time to celebrate the love you share as a family. It’s always important to show how much you care to those you love the most. Here are some ideas for fun activities the entire family can do to celebrate Valentine’s Day at home this year! Since Valentine’s Day falls on a Thursday this year, you can keep breakfast simple, especially if your family is usually rushing off to school or work in the mornings! If you have time, make some red velvet pancakes, bacon egg-in-a-heart, French toast sticks, or Overnight sausage & egg breakfast casserole. If you need something to go, serve up some sweet scones, breakfast egg muffins, or even donuts! Bonus points if you make them heart shaped. 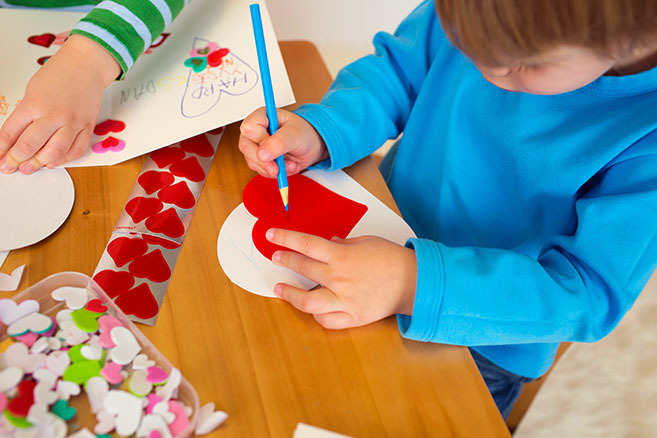 Instead of rushing out to buy gifts, get the family together to make homemade Valentines. This is a great way to spend some time with the kids and work on a craft together. This can be a simple craft with construction paper, markers, and even doilies or yarn! Get creative and have fun. Restaurants are always busy on Valentine’s Day so skip the rush and have dinner at home (either something you make yourself or ordering in from your favorite restaurant). You can make it special and set the table with your best dinnerware and candles (encourage everyone to get dressed up to add to the experience) or have something fun like a heart-shaped pizza. At the end of the day, gather everyone in the living room for a movie night, completely with Valentine’s themed snacks like pink popcorn, chocolate, or one of these sweet Valentine’s Day treats. You can watch a family favorite Valentine’s Day movie like “The Princess Bride,” “Enchanted,” “Shrek,” or “Wall-E” to name a few!